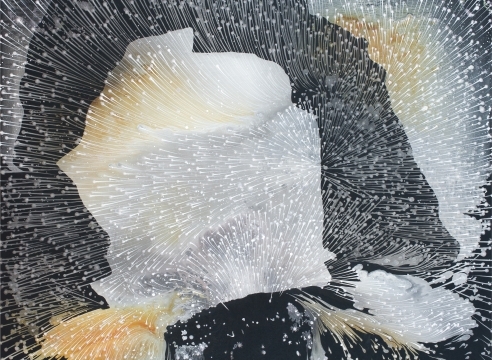 Barbara Takenaga earned her BFA and MFA at the University of Colorado Boulder. Recently, she presented a solo exhibition at DC Moore Gallery (New York, NY), and Nebraska, a 110’ wall project at Massachusetts Museum of Contemporary Art. Upcoming shows include a twenty-year survey of her work at the Williams College Museum of Art and an installation at New York’s Neuberger Museum of Art SPACE 42. Takenaga’s work is in the collections of the Crocker Art Museum (Sacramento, CA), Smith College Museum of Art (Northampton, MA), and the Pennsylvania Academy of Fine Art (Philadelphia, PA), among others. She is represented by DC Moore Gallery and Gregory Lind Gallery (San Francisco, CA). 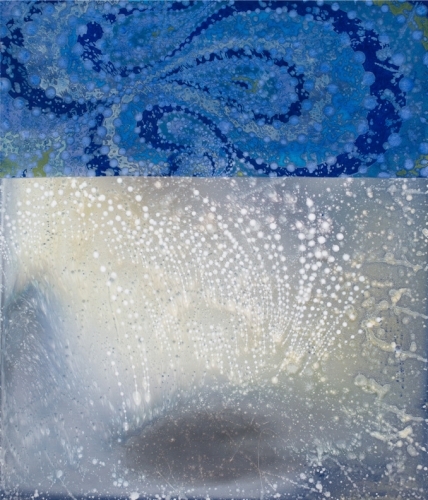 Takenaga resides in New York City and teaches at Williams College. Rachel Beach was born in London, Canada and lives in Brooklyn, New York. She received her MFA from Yale University and BFA from the Nova Scotia College of Art and Design. A 2015 Affiliated Fellow at the American Academy in Rome, Beach has been awarded grants and residencies from the Pollock-Krasner Foundation, Canada Council for the Arts, the Sharpe-Walentas Studio Program (New York, NY), Yaddo (Saratoga Springs, NY), and LMCC Process Space (New York, NY). Her work has been shown at institutions such as the Philbrook Museum (Tulsa, OK), Postmasters Gallery (New York, NY), and Lennon Weinberg (New York, NY) and has been reviewed in The New York Times, Art in America, Hyperallergic, ArtCritical, and The Brooklyn Rail, among other publications. Born in Worcester, MA, Morgan Blair moved to New York after graduating from the Rhode Island School of Design and currently lives in Ridgewood, Queens. She has shown her work at New York’s The Hole and Greenpoint Terminal Gallery as well as Left Field Gallery in San Luis Obispo, CA. She has painted large-scale murals in settings such as the New York offices of Facebook, Inc.; multi-media art spaces Death By Audio and Silent Barn; concert venue Mechanics Hall; and the Swanson Road Intermediate School in Auburn, MA. In 2016 she started Puzzle Time, an ongoing series of limited-edition wooden jigsaw puzzles hand-cut by herself and featuring the work of different contemporary artists. Amy Ellingson lives and works in San Francisco. She received a BA in Studio Art from Scripps College and an MFA from California Institute of the Arts. Her work has been exhibited nationally and in Tokyo, Japan, and is held in public collections such as the San Francisco Museum of Modern Art, the Crocker Art Museum, the San Jose Museum of Art, the Oakland Museum of California, and the Berkeley Art Museum. Chopping Wood on the Astral Plane, Ellingson’s solo exhibition with Eli Ridgway | Contemporary Art, was held in San Francisco in October 2016. Her public commission, Untitled (Large Variation) is a mosaic mural permanently installed at the San Francisco International Airport. She is the recipient of the Fleishhacker Foundation Eureka Fellowship and the Artadia Grant to Individual Artists. Brittany Nelson was born in Great Falls, MT and lives and works in Richmond, VA. She received an MFA in photography from the Cranbrook Academy of Art and a BA in photography from Montana State University. Nelson received a Creative Capital Grant in Visual Arts in 2015 and a Theo Westenberger Foundation Grant for advancing women in the arts in 2016. The following year, she was awarded a residency at the Headlands Center for the Arts. Nelson has had solo exhibitions at numerous venues including PATRON Gallery (Chicago, IL); Morgan Lehman Gallery (New York, NY); David Klein Gallery (Detroit, MI); and Sadie Halie Projects (Minneapolis, MN). Her work has been featured in publications such as The New Yorker, WIRED, Collector Daily, and the New Art Examiner. Alyse Rosner holds a BFA from the University of Michigan and an MFA from The American University. Her work has been shown in solo and group exhibitions at The Aldrich Contemporary Art Museum (Ridgefield, CT), Rick Wester Fine Art (New York, NY), Artspace (New Haven, CT), and Kathryn Markel Fine Art (New York, NY), among others. Rosner has received awards and fellowships from the Sustainable Arts Foundation, the Connecticut Commission on Culture and Tourism, The Aldrich Contemporary Art Museum, and The American University. Rosner’s work was recently acquired by Credit Suisse and can be seen in the Connecticut Artist Collection, as well as numerous private collections. She is represented by Rick Wester Fine Art in New York. Anne Vieux was born in Michigan and is currently based in New York. She received her MFA from Cranbrook Academy of Art and her BFA in Painting and Art History at the Kansas City Art Institute. Vieux’s work has been exhibited in solo shows at Annka Kultys Gallery (London, UK), Good Weather Gallery (Little Rock, AR), and Stream Gallery (New York, NY). Recent group exhibitions have been at The Hole (New York, NY), Silvermine Arts Center (New Canaan, CT), Regina Rex (New York, NY), Brooklyn Academy of Music (New York, NY), and Cranbrook Museum of Art (Bloomfield Hills, MI). Her printed work has been included in the library collections of the Metropolitan Museum of Art and the Museum of Modern Art.